As we begin our slow walk back from the abyss of September's box office, Hollywood tries out the novel strategy of releasing movies that actually appeal to certain demographics, including teenagers, action fans, and people who buy movie tickets. It's just crazy enough to work! In a development similar to the way that studios tried to draft off the wake of Harry Potter, the search for the next Hunger Games is on in earnest. While finding another near billion dollar worldwide earner is a particular long shot, as this year's Divergent shows, more modest, but still positive numbers are possible. 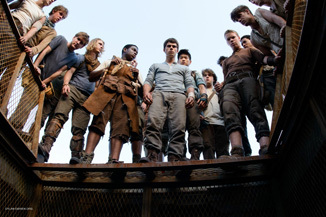 This week's entry into the YA Sweepstakes is The Maze Runner, though it's working at a significant disadvantage. There's a direct parallel to The Hunger Games in that it's set in a dystopian future where a group of boys are dropped into a competitive arena and left to fight among and fend for themselves. Each day, the opening to a giant maze opens up, leading to the hope of escape, but being that it's full of Things That Can Kill You, it makes things a bit challenging. The introduction of a new runner, named Audience Proxy, threatens to change the entire dynamic of the maze, as he seems to have some importance beyond the compound. This is brought home when another runner, the first ever female (a Kristen Stewart-bot model 2.0), arrives and knows little Proxy.